I charge per event, depending on the package picket by the customer. I direct them personally, making sure every moment looks natural. My photos won in international competitions, please see https://www.foto-arrigo.com/auszeichnungen-hochzeitsfotografie/ for a full list. If you need someone to telling with so much care and love the story of the most important day of your life, I’ll be happy to do it for you. I started my business in 2011 and have shoot over 250 weddings so far. 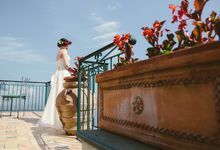 Professional wedding photographer, based in Switzerland.